If this sounds like you, you might be considering having your achy joint or joints replaced. Joint replacements generally tend to be very successful, allowing most people who have them to return to active lives free of chronic pain. But, while artificial joints are designed to last a long time, they won’t last forever. This means that if you’re a young, active person considering a hip or knee replacement, there’s a possibility that you would need to have the same joint replaced more than once. Just how long can you realistically expect an artificial knee or hip to last? Orthopedic surgeon Nicolas Piuzzi, MD, says the answer to that question isn’t exactly straightforward. It’s first important to understand that a joint replacement can fail early on or over a long period of time. Early failure isn’t common, but when it does occur it’s usually because an infection develops in the joint after surgery. One of the best things people can do to set themselves up for a successful procedure is to minimize their risk factors beforehand, Dr. Piuzzi says. Risk factors include things like uncontrolled diabetes, increased BMI or poor nutrition, which increase chances of an infection. “Even if you do a fantastic surgery from a technical standpoint, if you did not manage the patient’s risk factors, you might risk having an infection or a medical complication that might jeopardize the outcome of the procedure,” he explains. Long-term failure, on the other hand, is most likely to occur because the bond between the bone and the implant loosens over time, or a component of the implant wears down. When either kind of failure occurs, a revision surgery is needed to replace the original implant. That’s a pretty big deal, because revision surgery is a longer and more complex procedure. It requires specialized tools and implants, as well as a surgeon with advanced technical skills. So who can expect to need revision surgery? Based on many large studies of different joint implants, it’s generally thought that around 90 percent of modern total knee replacements still function well 10 or 15 years later. That number might be slightly higher for total hip replacements. But today’s replacements might last longer than those numbers suggest, since the world of orthopedic implants is evolving at a quick pace. One good example of a newer technology is a plastic called highly cross-linked polyethylene, which has very low-wear properties, Dr. Piuzzi says. There is good reason to suspect that implants made from this material will last longer than plastics that were previously used, but only time can tell. Surgeons also have new tools that they think could improve the longevity of a joint replacement surgery, such as robotic surgery. “We’ve seen that the partial knee replacement surgeries that we’ve been doing robotically seem to be doing better than the manually performed ones,” he explains. That doesn’t mean that every surgery should or will be done robotically. But in certain cases it’s showing potential to improve outcomes for patients. 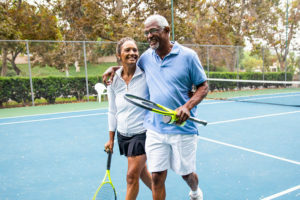 Whether you are a candidate for a partial or total joint replacement, there are many different kinds of artificial joints, and each person’s needs and experience will be different. You’ll also want to find a surgeon that looks at your joint replacement holistically – meaning he or she assesses your individual risk factors, helps you minimize them and creates a personalized plan to put you in the best possible position for a successful and long-lasting joint replacement.